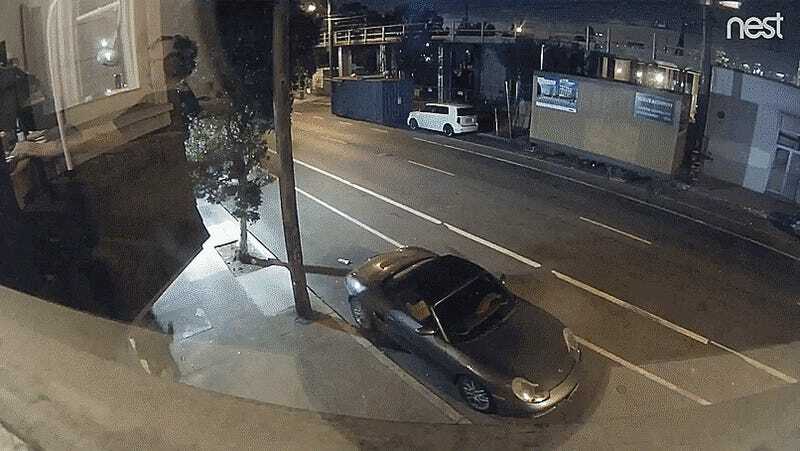 Alcohol is a hell-of-a drug, and it’s just about the only explanation I can come up with for why the person in this video was able to stumble so catastrophically straight into a street-parked 2001 Porsche Boxster S. Just wait until you see the dent. Full disclosure: this video was sent in by friend of Jalopnik Myriam, a journalist who was my co-driver for a couple of days during last year’s Mini Takes The States (which you can read about here). Damn, that’s quite a sizeable dent right above the wheel. I’m extremely curious what damage, if any, was caused to the stumbling projectile in question. In our correspondence, Myriam said the car was already scheduled for repairs, and I’ll follow up with any updates. In the meantime, I can’t stop watching this idiot. I sort of hope they ended up OK, but at the same time, it’s just shocking to witness. Please be careful where you park your bodies, people, and let’s hope this fool didn’t end up behind the wheel. Myriam, at least, seems to be taking it well—better than I would, but really, what can you do if you don’t catch it as it happens?